Grass cutting is among the essential gardening tasks you are supposed to do on a regular basis. However, if you don’t have enough time or the necessary set of tools, you can just get in touch with us and we will deliver a top quality grass cutting service at a competitive price. Our company operates in Chiswick and the surrounding areas seven days a week. We take pride in having lived up to the expectations of our valued customers as far as quality and affordability are concerned. 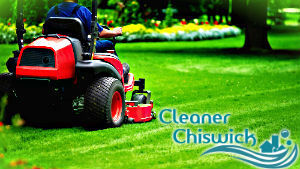 Our grass cutting services are well-known for their efficiency. Of course, the professionalism and can-do attitude of our gardeners can not be neglected. They have delivered a great number of grass cutting procedures throughout London and in W4 in particular and we are happy to say that the quality they deliver makes the number of our regular customers grow every day. Apart from grass cutting, we also offer additional gardening services, tailored to keep any lawn or garden in a good condition all year round. Find out more about them by contacting our friendly representatives. They will schedule a gardening visit at a convenient to you time. You can choose between a one-off and regular grass cutting service. As the service will be delivered by people who have already performed a great number of grass cutting procedures in Chiswick, we guarantee that the grass will be cut at a height that does not pose a risk of bald patches to emerge. However, it will not look overgrown at the same time. Don’t hesitate to call us and ask for your free quote. We are available seven days a week and you can arrange our teams during the official holidays too. We will make sure the service is delivered at the most convenient time.